This is beautiful, the colours are stunning! Thanks so much for sharing your shawlette with your fans! Beautiful…?❤️???? Thank you for the colorful hearts, Teei! ohhhh love rainbows! beautiful yarn, beautiful shawlette! thanks for sharing the pattern with us! Very pretty, and I love the name! 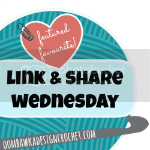 Thanks for sharing on my link party!